Possible make-up revisions for Discovery are not discussed here. Please refer to The Visual Continuity of Star Trek. 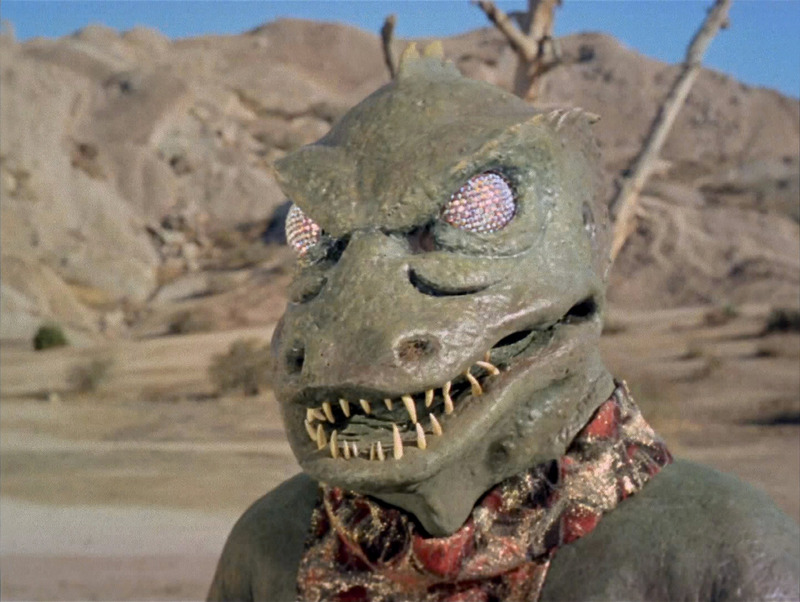 The reptilian Gorn appeared in just two life-action Trek episodes: TOS: "Arena" and ENT: "In a Mirror, Darkly, Part II". The latter dealt with a Mirror-Universe Gorn, but there is no reason why the Mirror Gorn should have a different physiognomy. 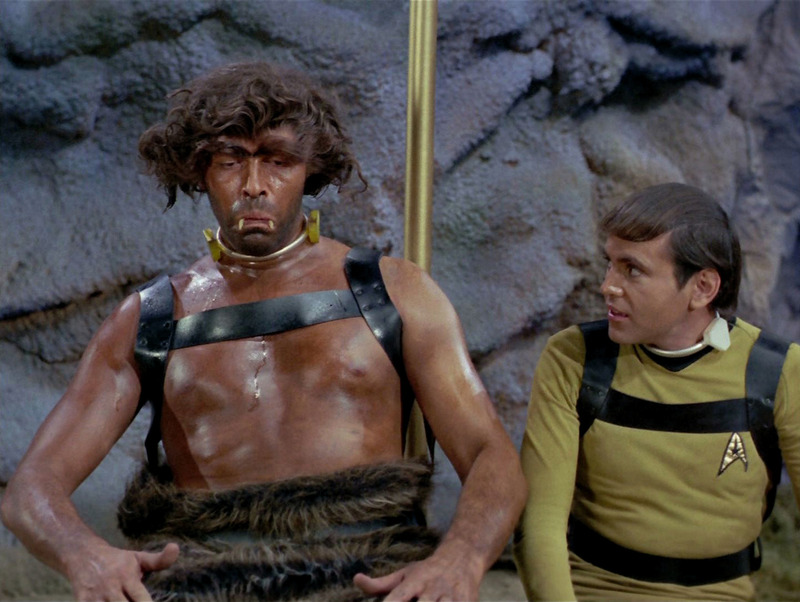 Anyway, the Gorn captain in TOS looked very clumsy because he was played by a human actor in a thick rubber costume. In particular, the mouth and the faceted eyes that were reminiscent rather of insects than of reptilian species remained immobile. 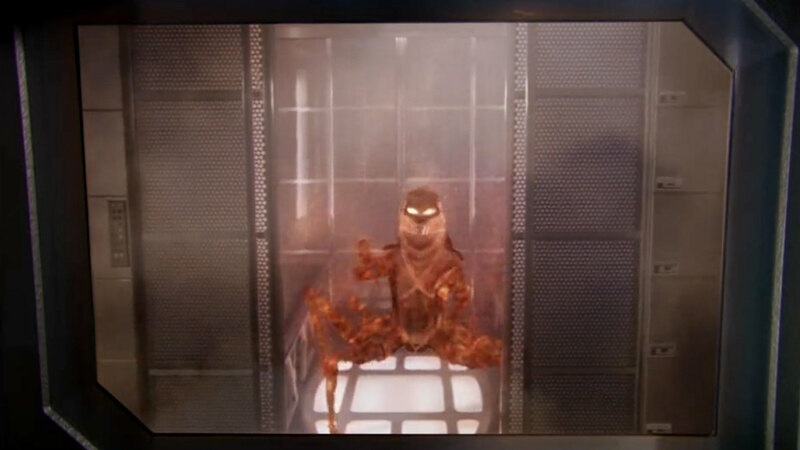 In the ENT episode the Gorn was computer-generated and accordingly agile. The body proportions and the features were adapted to look more like on actual reptilians, such as the slit iris. We may be inclined to accept this as a more accurate depiction of the Gorn species. Another quite definite difference, however, is that the TOS Gorn has five fingers, while the ENT version has just three. The remastered episode TOS-R: "Arena" didn't change anything about the clumsy look of the Gorn captain, except that he infrequently closes his eyelids for a split second. If this Gorn is the same species as the one on Enterprise, the compound eyes may be actually an inner eyelid that would be open all the time aboard the dark ship in the ENT episode. 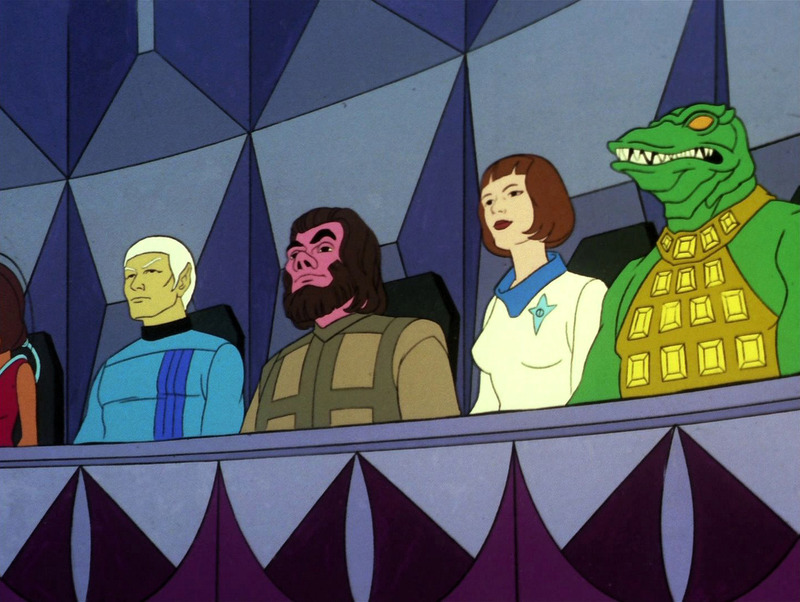 The Gorn in TAS: "The Time Trap" is an adequate stylization of the life-action version of TOS. 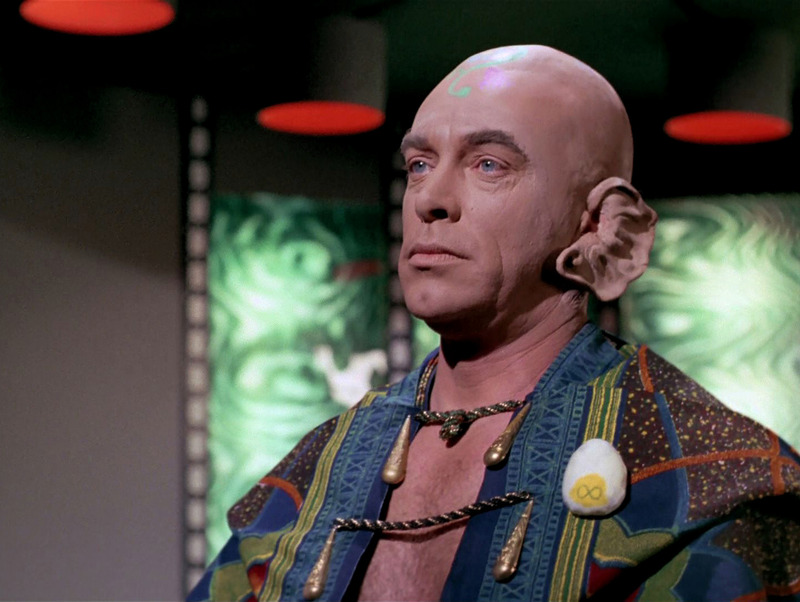 Tholians could be seen in only two Trek episodes: TOS: "The Tholian Web" and ENT: "In a Mirror, Darkly, Part I". 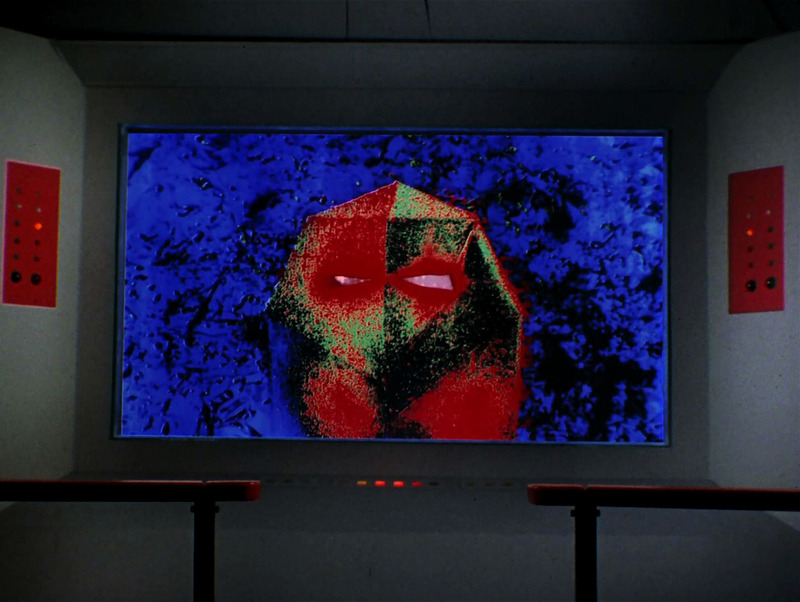 For almost four decades it was unclear whether the Tholian that appeared on the viewscreen of the Enterprise was a real image of a member of the species, a Tholian wearing some sort of mask or helmet or perhaps the real look of a Tholian face. Considering that the "face" didn't move in any fashion in the TOS episode, I was inclined to believe that we were looking at some sort of mask worn for biological or ceremonial reasons. 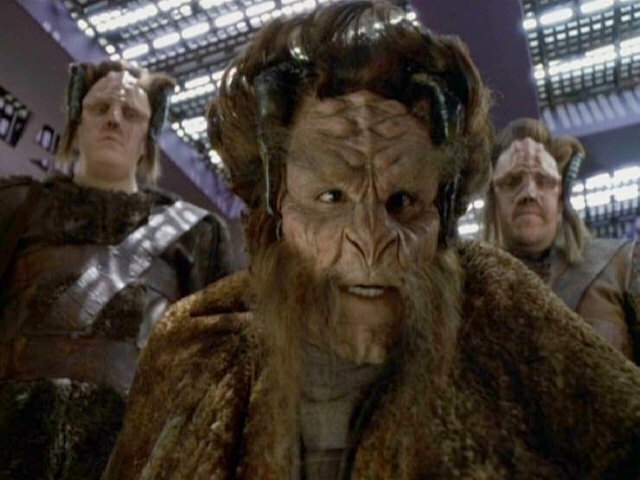 Since the ENT episode, however, we know for sure that the Tholians really look like this (taking for granted that the ones in the Mirror Universe aren't any different). The so far unseen rest of their bodies is non-humanoid as well. Clearly the new CGI version is a lot more realistic than the old mask that looked more like a pop art painting than something that could be organic. The Tholian Commander Loskene still looks the same in the remastered episode TOS-R: "The Tholian Web", like a mask without motion, in spite of the previous revision in Star Trek Enterprise. ENT: "In a Mirror, Darkly, Part I"
We could see two male members of this race, namely Dr. Sevrin in TOS: "The Way to Eden" and Crewman T'Lor in DS9: "The Ship". The two men have the conspicuous cauliflower ears in common, in spite of the 30 years between the two episodes. This is a clear sign that they are supposed to belong to the same race. 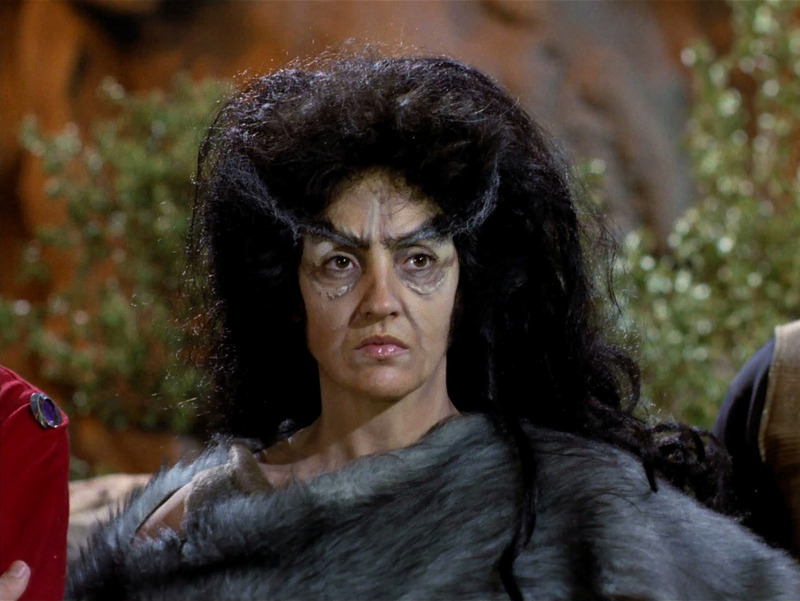 As mentioned on our page on Sexual Dimorphism of Star Trek Aliens, Zora, a female Tiburonian, albeit one created by the Excalbians in TOS: "The Savage Garden", looks very different. Yet, there is also a discrepancy in the look of the male male members of this race: T'Lor sports a slight ridge running across his forehead that the equally bald Dr. Sevrin doesn't have. TOS: "The Way to Eden"
Caitians, or more precisely, feline species that are commonly referred to as Caitians, could be seen in The Animated Series (M'Ress), in "Star Trek: The Voyage Home" (two members of the Federation Council) and in "Star Trek Into Darkness" (Kirk's two bed bunnies). Actually, none of them was ever said to be Caitian on screen, so in the strictest definition of canon the three species neither have to be all the same, nor does any of them have to be Caitian. 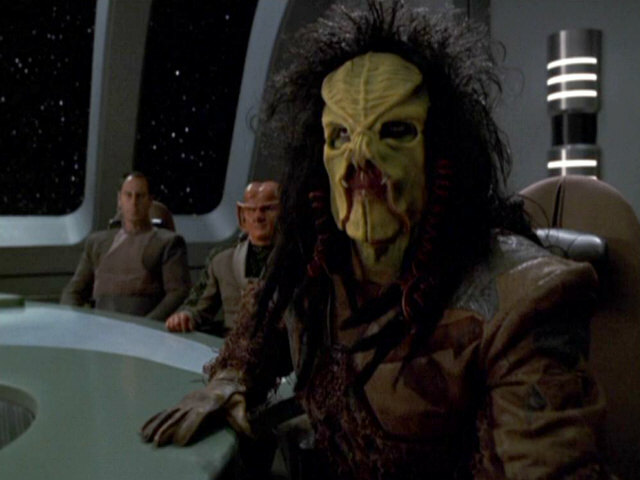 The race of Enterprise bridge officer Lt. M'Ress, who appeared in a number of TAS episodes, was first called Caitian in non-canon sources. Her face is overall furry, as far as we can tell from the jagged contour of her cheeks and chin. She has pointed furry ears, yellow eyes, a T-shaped nose and a long tail, all very typical of cats. The overall shape of her head with the placement of the ears, her breasts and the upright walk on the other hand, are humanoid. Also, she has long hair much like many human women, for which a slightly darker color than for her facial hair was chosen, but probably mainly for stylistic reasons. So it may be her real hair and real hair color. The look of M'Ress apparently inspired the makeup of two members of the Federation Council in "Star Trek: The Voyage Home" but it is unknown whether they were called Caitians at least behind the scenes. The Art of Star Trek, for instance, simply refers to them as "dignitaries". 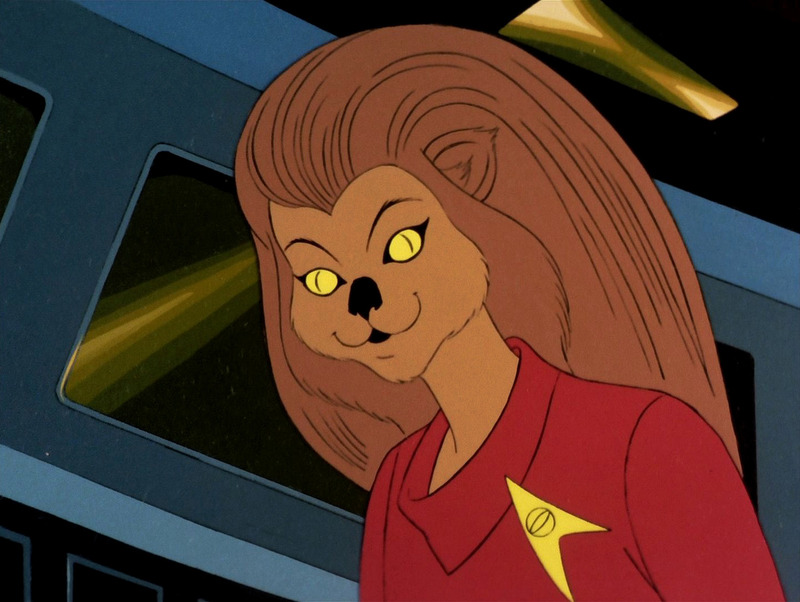 The look of the one dignitary with reddish brown fur/hair largely matches that of M'Ress. He too has the ears on the side of his head, unlike an actual cat. Unlike M'Ress, this apparently male individual sports a beard, which is somewhat reminiscent of the ruff of a lynx. 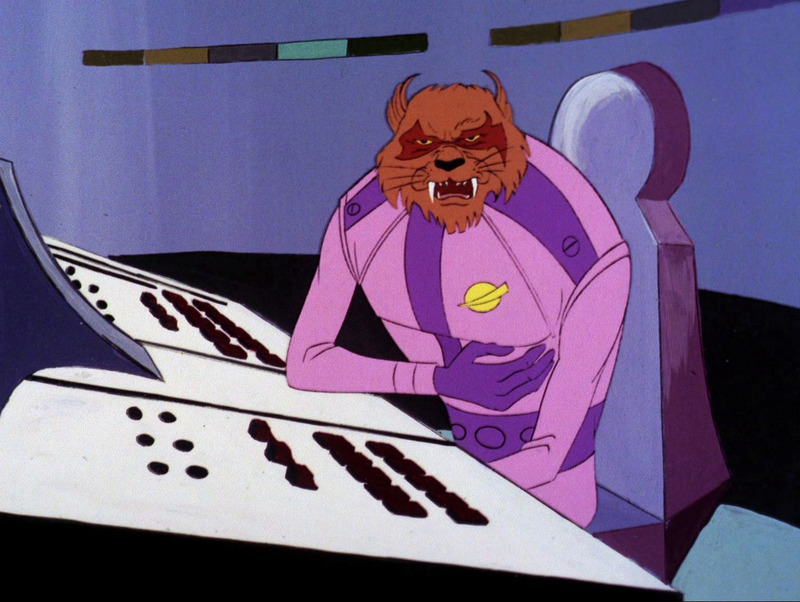 The other possible Caitian in the movie has black fur and seems to look a bit less cat-like. But his facial features may just look different and more human-like because he lacks the "lynx beard". Both have light green or yellow eyes. The two do not sit next to each other in the conference room as many other pairs of the same race, but since they both wear Starfleet uniforms, it seems possible they represent Starfleet, rather than their (presumably common) home planet. Overall, it is a logical assumption that if M'Ress is Caitian, these are two more members of her race. Finally, we have the two slightly feline girls in Kirk's bed in "Star Trek Into Darkness". They were referred to as Caitians by Damon Lindelof. In an interview with startrek.com, he confirmed that they are supposed to be the same species as M'Ress. The two (played by real-life twins Katie and Kellie Cockrell), however, look totally different than M'Ress. They have no cat ears, no cat nose, no furry body, and their eyes may not be yellow. The only visible distinguishing marks from other humanoids are the spikes on their cheeks and necks, and the tail. The latter is also the only feature they have in common with M'Ress or with cats. The evidence is undeniable that they can't be the same species as the TAS character. So unless we subscribe to the idea of the Abramsverse being a total reboot or a total visual reboot (in which case the whole discussion of this issue, among many others, would be utterly pointless), what Lindelof says can't be true. The bottom line is, we have three characters, M'Ress and the two Federation Council members, who could easily be the same race and who might all be Caitians. The two girls in Kirk's bed are neither. Side note There are other feline races in Star Trek besides the Caitians or the candidates that could be Caitians. The Kzinti from TAS: "The Slaver Weapon" are sometimes said to be related to the Caitians, for which any canon evidence is missing (obviously, because strictly speaking there is no canon race called Caitians). It is obvious that since Kirk's girls are not really feline they can't be related to the Kzinti either. The three-breasted cat woman from "Star Trek: The Final Frontier", on the other hand, shares a few more features with humans than the supposed Caitians or the Kzinti. Her skin is hairless (albeit with dark streaks), and her eyes and nose are more human. The third breast may not be natural. So there is a slight chance that Kirk's twins are of the same race, although there is only a remote resemblance. The Nausicaans appeared most notably in TNG: "Tapestry" and ENT: "Fortunate Son", but also somewhat less prominently in a quite a few other TNG, DS9, VOY and ENT episodes, namely TNG: "Gambit, Part I", DS9: "Heart of Stone", "Improbable Cause", "Bar Association", "Favor the Bold", "The Sound of Her Voice", "Prodigal Daughter", VOY: "Q2", ENT: "Canamar" and "Borderland". The TNG, DS9 and VOY Nausicaans were all using up the masks originally made for "Tapestry". They have two comparably thin bulges running from their deep eye holes upward in a 45° angle across their raised foreheads. These seem to continue underneath the combined mouth and nose, forming a characteristic "X" in the Nausicaan face. In addition, a thin channel is running in the middle down their chin. There are two roughly horizontal and two vertical protruding teeth in their mouths, whose sizes may vary, forming a "+". Their foreheads are slightly wrinkled. The Nausicaan skin color varies from dull light brown to ochre. Nausicaan hands are almost like human hands, sometimes with black finger nails. The Nausicaan look changed noticeably between VOY: "Q2" and ENT: "Fortunate Son". When the Nausicaans were to play an important role again the existing masks were either worn out, or it was deemed useful to slightly update their look for the episode. Anyway, the ENT Nausicaans have an overall less rectangular face. They feature thicker bulges and wrinkles on their foreheads, although overall their foreheads are not raised as high and are now much like those of the Klingons. The lower bulges are more like lobes now, making the chin look more complex. The eye holes are far less pronounced and look more human-like. The wrinkles around the nose are toned down, and the mouth now looks wider that it is tall. The fangs are reduced in size, although their size was subject to vary already in the TNG/DS9/VOY episodes. Most noticeably, however, the ENT Nausicaans have three or four spines on their foreheads, as well as spines on each of their fingers (on the metacarpal bones, to be precise). Their skin color is a similar ochre as previously, but a tad more intensive and glossy. Finally, we can see the hairline of all ENT Nausicaans that wraps around the forehead bones, while the curly wigs of TNG/DS9/VOY version always covered this region. Overall, the old and the new Nausicaans almost look like two different species. While the slight variance of the bone structure may be explained away rather easily, it remains a mystery why the Nausicaans obviously lose their forehead and hand spines from the 22nd to the 24th century. On a side note, the Kradin from VOY: "Nemesis" (which may be inspired by the look of the "Predator" in the 1987 Schwarzenegger movie of the same name) are reminiscent of the Nausicaans. But their make-up is an entirely different one. The two Nausicaan variations are much more alike than either of them resembles the Kradin with their much larger mouths and the otherwise missing protruding features. The Talarians were first mentioned, but not shown in TNG: "Heart of Glory", where the freighter Batris had a Talarian registry. 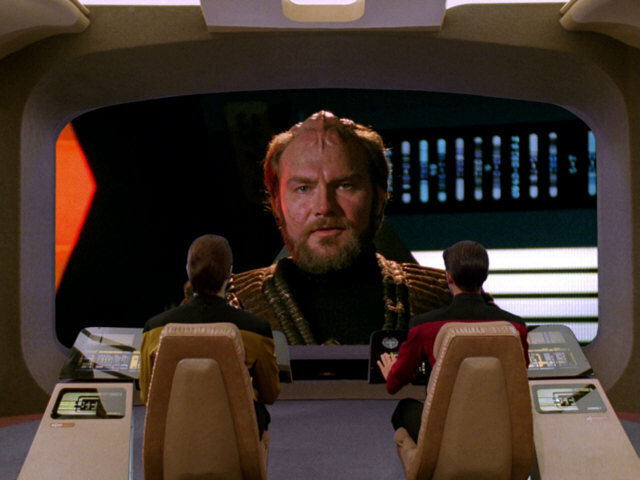 When they played a major role in TNG: "Suddenly Human", a couple of Talarians such as Captain Endar were seen, all of them with an almost human-like appearance with hair and sometimes facial hair, only with additional ridges on the heads. Another one purportedly appeared in DS9: "Improbable Cause". Garak pointed out a Talarian to Bashir, but the person standing in that direction was quite unlike the Talarians shown before. The facial ridges were similar, whereas this version of the Talarian race had a characteristic "ring" around the head and a completely different face, especially the nose. The Star Trek Encyclopedia III mentions the obvious difference but doesn't come up with a proposal how to solve the problem. It is still possible but implausible that the two appearances represent two races (in the meaning of ethnic groups) of the same species. The one from TNG would seem to be much closer related to humans than to the one from DS9. Another possible explanation is that the DS9 Talarian who appeared only once is actually a hybrid with still another species, but how would it be possible to identify him as Talarian? A similar problem would occur with the theory that this Talarian was identified by Garak only because of his clothes, but would be actually a member of a different race kidnapped by Talarians just like Jeremiah Rossa in the TNG episode. Garak, as a tailor, may pay more attention to clothes than faces, but still he wouldn't call someone a Talarian who doesn't look like one. 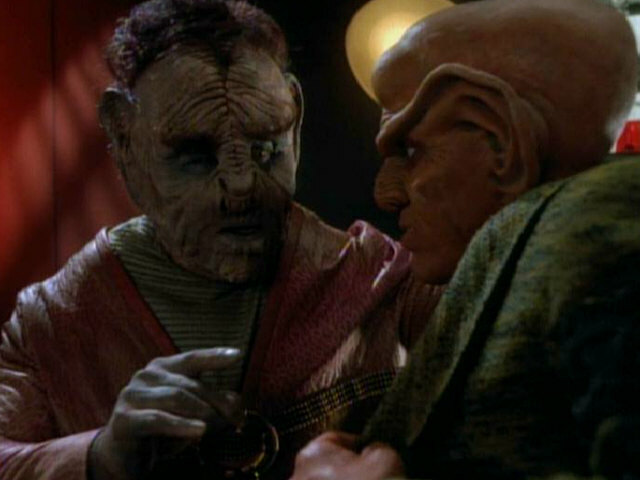 As a matter of fact, the alleged Talarian has a make-up identical to that of the Kobheerians (DS9: "Duet", "Second Skin"). Maybe there was a Talarian hiding somewhere behind the Kobheerian? 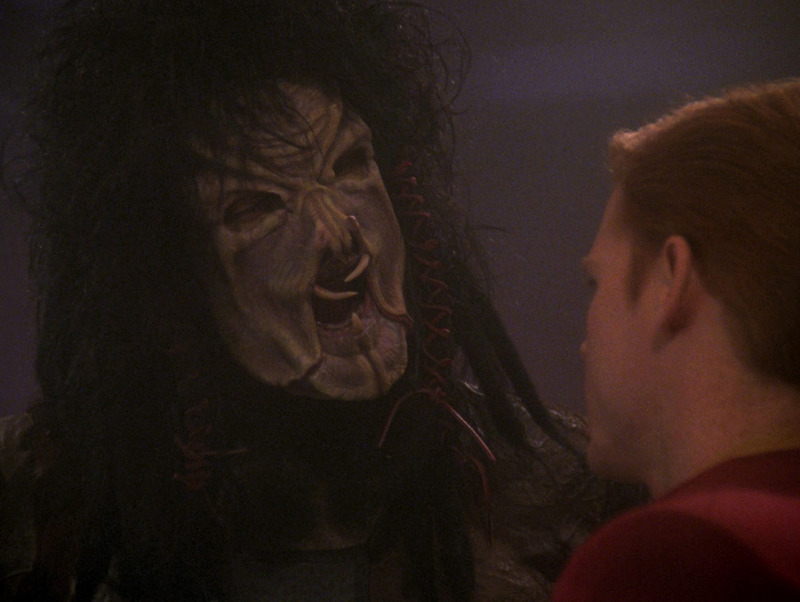 Surprisingly, an alien with the very same make-up appears in the Delta Quadrant in VOY: "Survival Instinct". It is obvious that this one is neither supposed to be a Dopterian nor a Kobheerian, much less a Talarian. 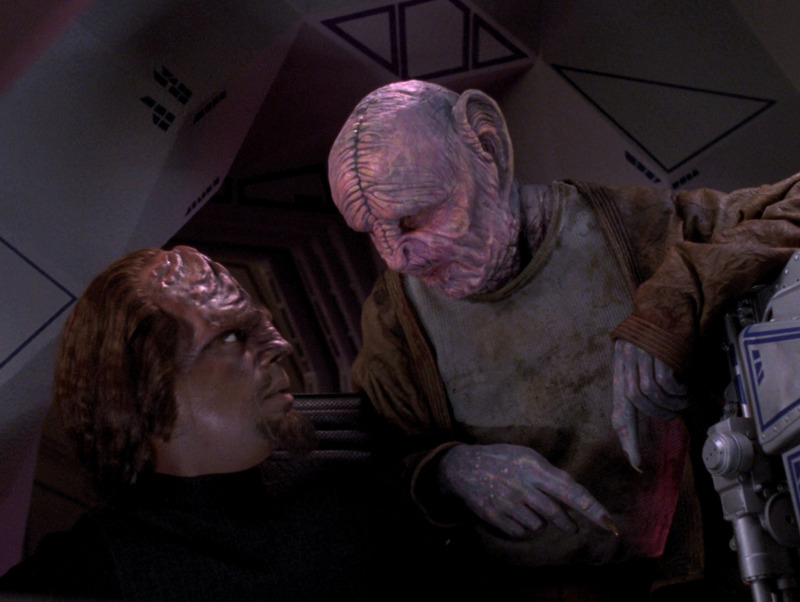 The man who is injured by Molly O'Brien in DS9: "Time's Orphan" is identified by Captain Sisko as a Tarkalean. However, that man has the same make-up as the race frequently seen on DS9 and previously established as being Markalian in DS9: "Hippocratic Oath". 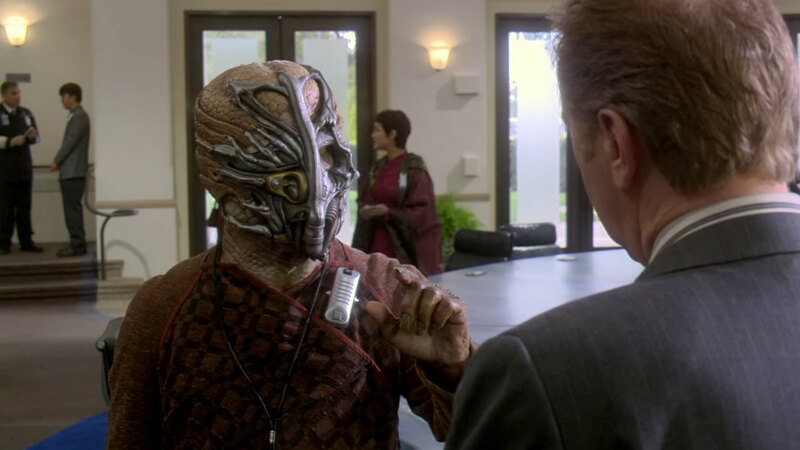 Tarkaleans, on the other hand, appear in ENT: "Regeneration", but here with a completely new look, the make-up being the same for male and female members of the species. 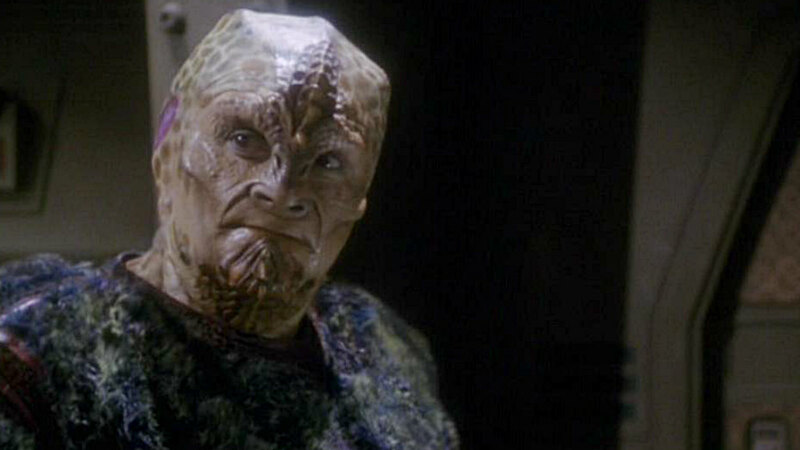 It would be very implausible if some Tarkaleans looked like Markalians, whilst other members of the same race sported a distinctive look. So most likely someone was mistaken about the origin of the man in "Time's Orphan", even though "Tarkalean" may have been in the episode's script. Captain Sisko has not necessarily seen and identified Molly's victim himself, he may have just read "Tarkalean" in Dr. Bashir's and Odo's reports. Neither of the two would likely make such a blatant mistake in an official document. So the only good explanation is a simple slip of the tongue by Sisko. "Tarkalean" indeed sounds a lot like "Markalian". In "The Cage" Captain Pike's landing party is attacked by the inhabitants of Rigel VII called the Kaylar (spelling as in the Star Trek Encyclopedia). They are savage humanoids that look like humans, just with very bad teeth. Among the drill thralls on Triskelion in TOS: "The Gamesters of Triskelion" there is a man called Kloog, who may well be another Kaylar warrior. His look is overall human as well, but he has characteristic fangs and bushy eyebrows setting him apart from the one seen in "The Cage". When Dr. McCoy comes back "from the dead" in TOS: "Shore Leave", he is accompanied by the recreations of two cabaret dancers he once met on Rigel II. Both are human-looking. Mr. Hengist, who investigates the murder on Argelius in TOS: "Wolf in the Fold" but whose body is actually the host for an alien entity named "Redjac", is said to be a native of Rigel IV. His appearance is entirely human too. TOS: "Wolf in the Fold"
Perhaps some inhabitants of Rigel shown in TOS may have looked different with a higher budget and better make-up techniques. 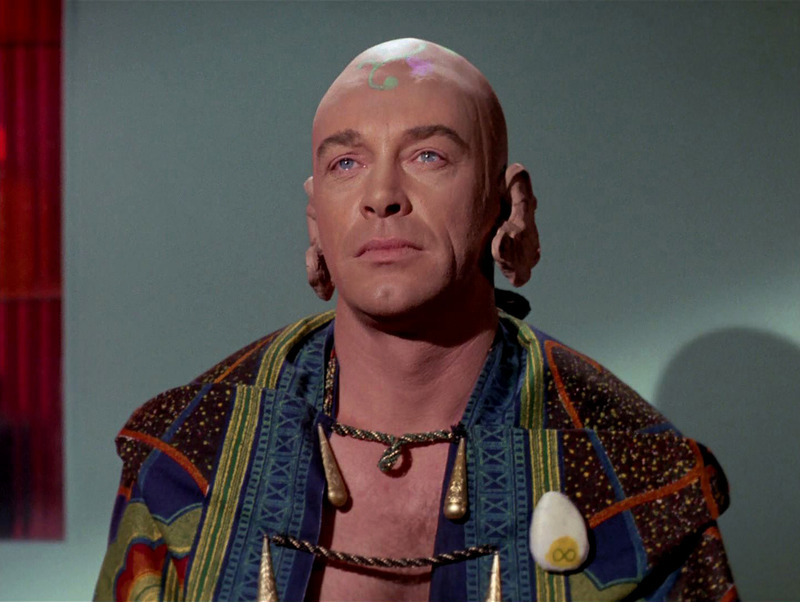 In any case the Rigelians were supposed to be a distinct alien race already at the time of TOS in spite of the impression of Rigel (with the exception of Rigel VII) being a human colony. This was further corroborated in the following four Trek series, however, without showing a genuine Rigelian. TOS: "Journey to Babel" suggests that their blood chemistry is similar to that of the Vulcans. They may contract a neurological disease knows as the Tuvan Syndrome just as the Romulans, as mentioned in DS9: "Inter Arma Enim Silent Leges". Also, in ENT: "Cogenitor" Dr. Phlox believes that there are four or five Rigelian genders. In ENT: "Broken Bow" Enterprise NX-01 visits Rigel X, then (2151) an alien world unknown to humans. The station on Rigel X is the home to an multicultural interstellar community, and it would be hard to make out natives of the planetary system among the various species. In a deleted scene (that can be found on the DVD) there is a dockmaster with a look very similar to that of the Markalians, only with a different hue and pattern of the now somewhat smoother skin. It is possible that he was supposed to be an indigenous Rigelian at the time. 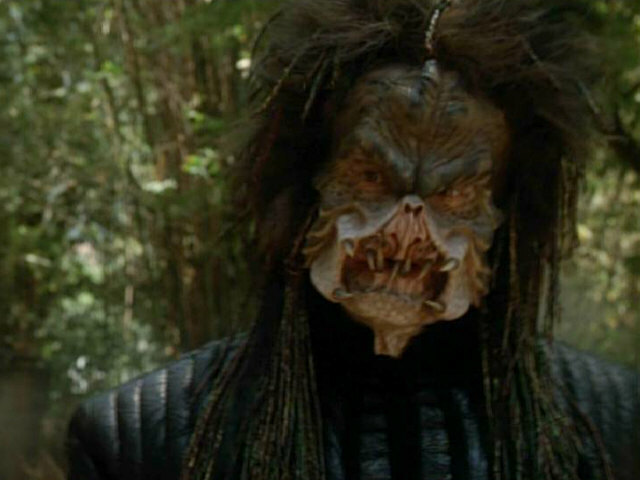 The actual Rigelian natives appear as late as in the fourth season of Star Trek Enterprise. 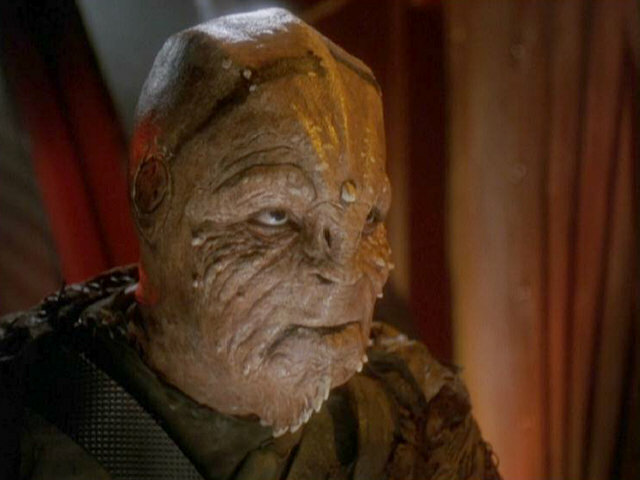 While the make-up of Phlox's Rigelian kidnappers in ENT: "Affliction" is barely recognizable, the ambassadors seen in ENT: "Demons" and "Terra Prime" have a characteristic look with bulges along their noses and around their eyes. Interestingly, they also have four nose holes just like the Markalians. In addition, the Rigelians sport colorful marks on their pale faces that look like tattoos. Enterprise visits the planet Rigel X one more time in ENT: "These Are The Voyages" in 2161 (at least in Riker's re-enactment whose authenticity is doubtful). 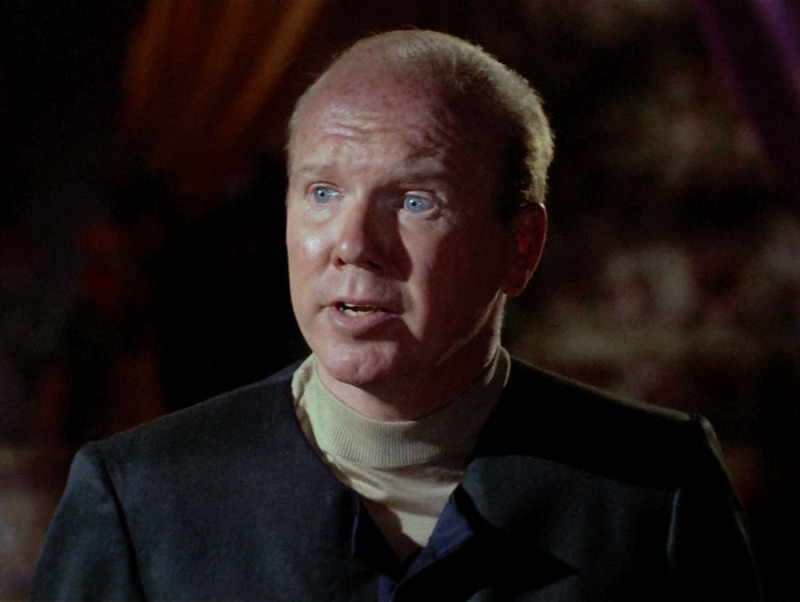 Although one of the gangsters who board the ship in the holographic simulation looks a bit like the Rigelian ambassadors with his colorful face, none of them has to be a Rigelian. 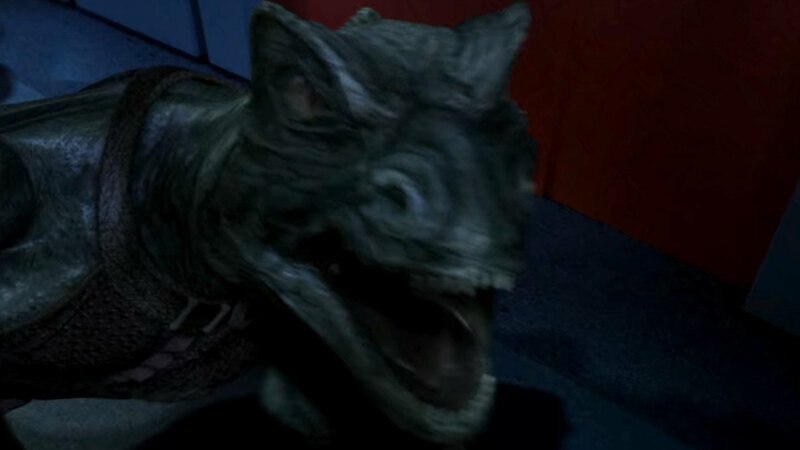 Side note There are reptilian Federation members called "Rigellians" in "Star Trek: The Motion Picture", but they are identified as such only behind the scenes, allegedly descended from "saber-toothed turtles". 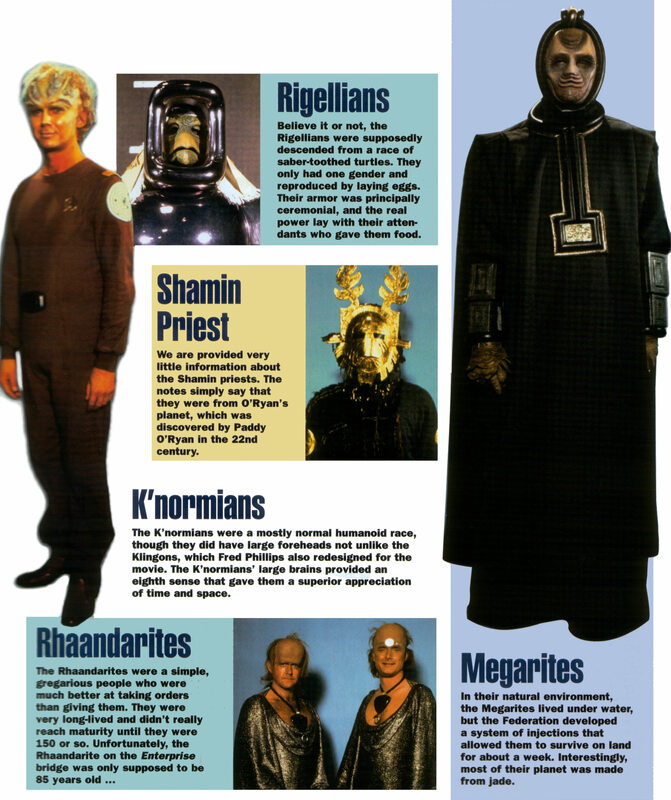 We may not want to and do not need to take these non-canon Rigellians into account. Identifying the "true" Rigelians is not only a question of make-up, considering that Rigel (besides Antares) is a writer's favorite among the real stars and constellations for throwaway references. Hence, aside from the few times that we really see Rigel's planets, denizens or ships, the planetary system appears to be quite diverse and somewhat contradictory. Star Trek Enterprise adds to the confusion by not acknowledging that Rigel is actually the human name of a star, and not something that would be called so in a Klingon database. On the other hand, the real Rigel is so far away from Earth (some 800 light years) that it would be far out of reach for Enterprise NX-01. Keeping in mind that this Rigel (X) would better be a totally different star system than the real star and that the various planets of the Rigel system may have developed different cultures or that some may be colonies of the Federation, there is no problem explaining away the different looks of the denizens of Rigel. While logic requires that the warriors from Rigel VII are indigenous to the planet, all of the more civilized human-looking inhabitants of the Rigel system may indeed be human settlers. In particular, Rigel V as mentioned in "Journey to Babel" may be the Rigelian homeworld, while the "cabaret planet" Rigel II and the mining planet Rigel XII seen in TOS: "Mudd's Women" may have a predominantly non-Rigelian population. It only remains a problem to explain the "primitive" wood carvings on Rigel IV as mentioned in TOS: "Wolf in the Fold", unless this planet were the home to yet another otherwise unmentioned third indigenous species of the system. On the other hand, it wouldn't be unheard of if immigrants from some other world had imported their traditional way of living. Alternatively, Rigel IV could be the homeworld of the species known as the Rigelians, rather than Rigel V. It would make sense considering that Rigel IV is the more prominent planet, it would only be implausible to refer to the human Mr. Hengist as a native of an alien planet. But perhaps he is a diplomat's son? It has long been speculated whether members of the Coridan species were among the delegates aboard the USS Enterprise in 2268, when the admission of their planet to the Federation was being debated (TOS: "Journey to Babel"). This idea has to be negated in light of more recent evidence. We see the first Coridans identified as such as late as in ENT: "Shadows of P'Jem": the planet's chancellor and a man named Traeg. Their make-up is almost human, the only visible distinguishing mark being wrinkles above their noses. 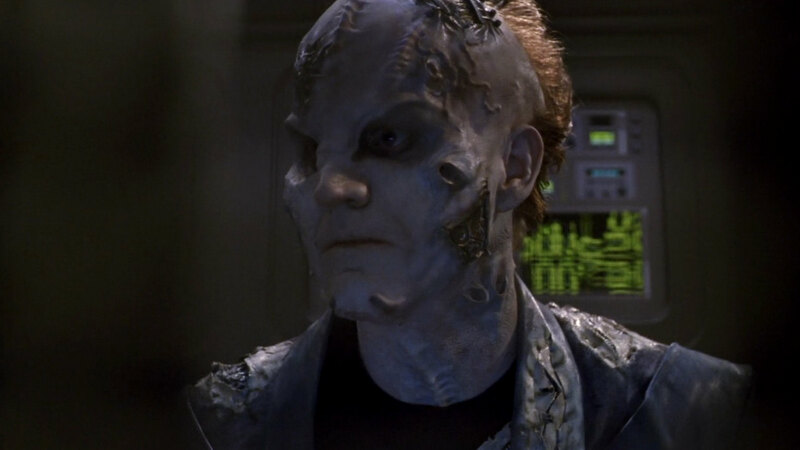 When a Coridan appears for a second and last time in ENT: "Demons", the ambassador's face is mostly covered by a metallic mask, but from what we can recognize behind it his hairless skull is clearly not human at all but rather reptiloid. The mask could be a breathing apparatus or could have a ceremonial purpose. Still, the ambassador definitely belongs to a different species than the other Coridans. Another unsolved mystery about the Coridans is their planet's decline. In 2151 Coridan had a population of 3 billion and a flourishing shipbuilding industry. In 2268, it was considered "underpopulated", making it susceptible to illegal mining operations. Maybe the ambassador is the member of a different species, who were working in the Coridan shipyards in large numbers in 2151 and left the planet after the demise of the industry? We can see Yridians in no less than 28 episodes (TNG, DS9 and ENT: "Twilight"). They all have their heavily wrinkled skin and big ears in common. Looking at their hands, two of them, namely Yranac in DS9: "Gambit" and Ashrock in DS9: "Melora" do not have the typical hands where the thumb and the forefinger are grown together. These two Yridians have five fingers. The dissimilarity apparently has a practical reason: Yranac is eating with his fingers, and Ashrock is holding and looking at one of the precious Rings of Paltriss, both of which may have been problematic with an unwieldy glove. There is an additional anomaly setting apart these two members of their species. They are the only Yridians with hair, and as the sparse locks of Yranac prove that it is not just a fashionable wig, of the kind some Bolians may be wearing. So we may conclude that there is either an Yridian sub-species with five fingers and with hair, or the two are hybrids. Two entirely different make-ups exist for the Boslics. 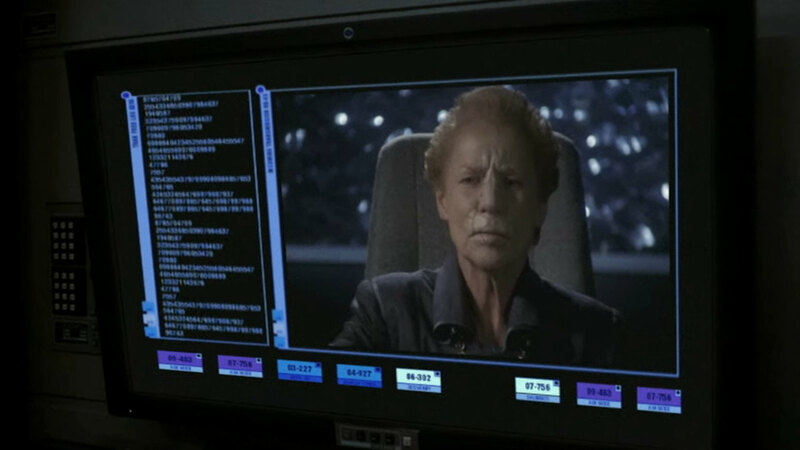 The first Boslic to appear on screen is a female captain in DS9: "The Homecoming". A purple-haired woman with a forked furrow on her forehead and significantly protruding bones above her eyes is quite obviously meant to be the "Boslic captain" that Quark mentions to Kira. Her character appears two more times, in DS9: "The Abandoned" and DS9: "Broken Link", played by the same actress. Each time she is referenced to as "Boslic captain". The name Rionoj is given in the script of "Broken Link", but didn't make it to the screen. With Rionoj's look established as Boslic, it surprises that in DS9: "Sons of Mogh" a very different looking male freighter captain identified as a Boslic appears. His name is Tilikia. This guy has forehead bones not unlike the Klingons, a wrinkled nose and brownish hair. His look has absolutely nothing in common with Rionoj's, at least not more than the guises of any two separate humanoid species. The fact that Tilikia's subordinates have the same appearance corroborates the notion that this is what Boslics should look like in general, because how could it still be a Boslic freighter if it were completely operated by one other alien species? Retroactively we can make out even two more male Boslics that had appeared in previous episodes but were not mentioned as such. The first is Jaheel in DS9: "Babel" and the second is Narik in TNG: "Gambit". Both evidently have the same make-up as Tilikia in "Sons of Mogh". As a solution to the dilemma, we could have theorized that Boslic females might have a completely different look than Boslic males, as if they were a different species. But newer evidence clashes with this idea. 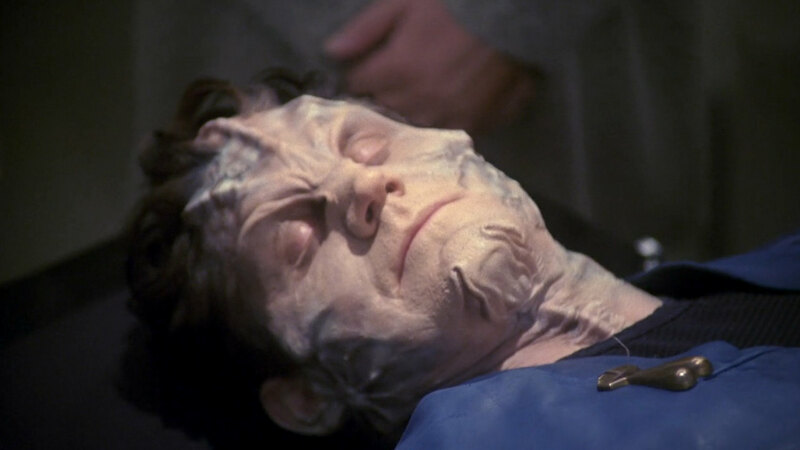 In VOY: "Unity" a male ex-Borg can be seen with the female Boslic make-up, albeit without the purple hair. In ENT: "Borderland" we can identify another male member of Rionoj's species with dark hair. Maybe the female captain had dyed hair and was not really a member of the Boslic race but just operating a Boslic vessel like Kasidy Yates was working for the Petarians. This is not perfectly reasonable either as it would be much more practical to classify people by their look in a confusingly diverse universe. 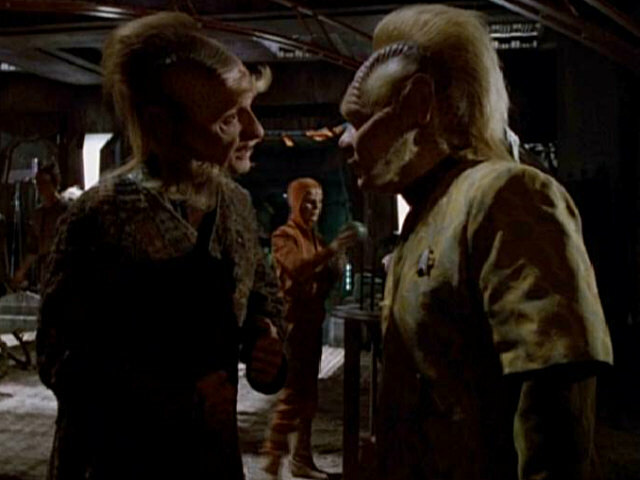 The male Boslic make-up reappears in VOY: "Fair Trade". While Bahrat, the station's administrator, sports a different wrinkle pattern, his two aides are definitely wearing the familiar Boslic prosthetics. They are likely all supposed to be the same species, but obviously the Art Department didn't create new masks for the extras. 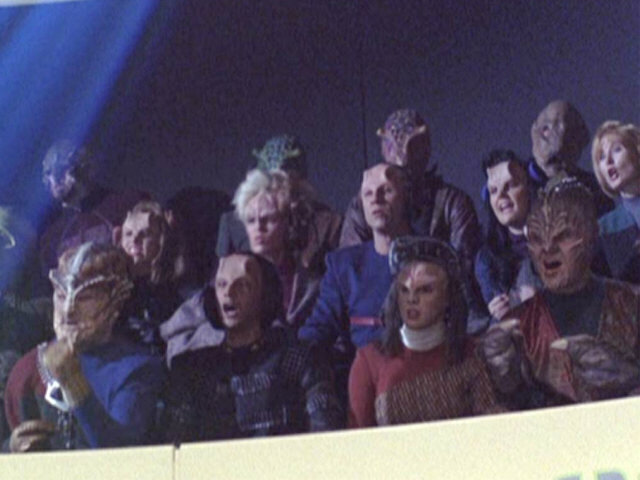 The female version, on the other hand, can be seen amongst countless other re-used make-ups (that equally don't belong there) in the Tsunkatse arena in VOY: "Tsunkatse". The Ktarian woman Etana Jol who appears twice in TNG: "The Game" has pronounced cranial bones. She is the only one of her race seen in the episode. Naomi Wildman, who is the daughter of Ensign Samantha Wildman and a Ktarian named Greskrendtrek, looks very different with her spikes on the forehead. It is possible that Naomi has not inherited much from her Ktarian father. But it seems illogical that she would have characteristics of what looks like still another species besides humans and Ktarians. The idea that her appearance will be closer to Etana Jol once she has grown up does not apply, since we know that she will still have her little spikes when she is in her twenties, as evidenced in VOY: "Shattered". During Voyager's run the only noticeable change to Naomi's make-up was adding a fourth spike to her forehead since her appearances in season four when the child was two years old (and far ahead of her development by human standards). 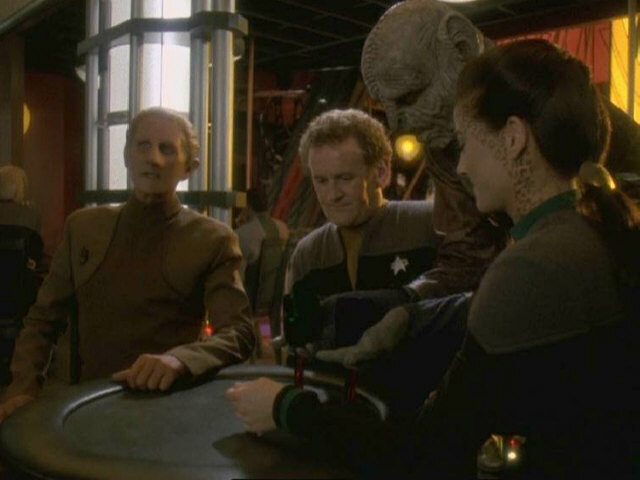 Naomi's daughter Sabrina appears in VOY: "Endgame". There is no clue to which species her father belongs, but the make-up is the same as Naomi's. It is possible that, besides their fast growth, Ktarian-human half-breeds generally develop features that don't look like either of the two species. VOY: "Once Upon a Time"
An alternative theory, based on cultural considerations and more observations from the show, is that the hostile Ktarians from TNG: "The Game" are a completely different race than the friendly Ktarians of Naomi's kind. A third Ktarian variety who shows up as a Borg drone in VOY: "Dark Frontier" adds to the confusion. This Ktarian doesn't look like either of the previous two versions. 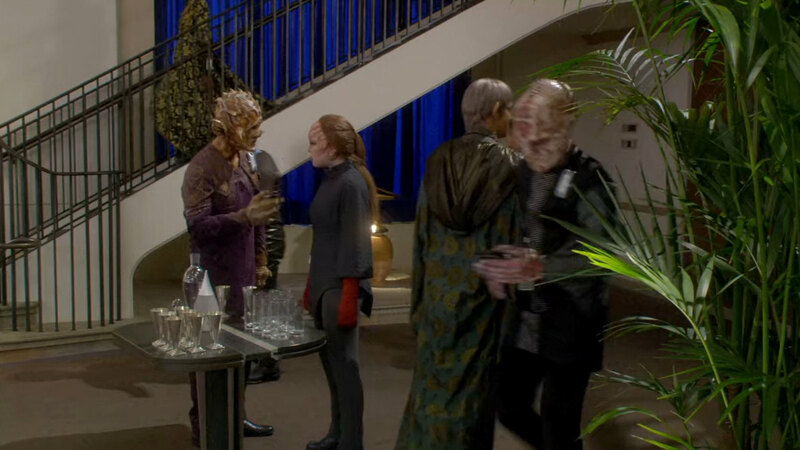 Besides Samantha's marriage the Ktarians have become one of the most often and most casually quoted species and show up in countless references such as Ktarian eggs ("Star Trek Generations"), Ktarian chocolate puff (TNG: "Liaisons", VOY: "Body and Soul"), Ktarian pudding (VOY: "Someone to Watch Over Me"), Ktarian Merlot (VOY, "Scientific Method"), Ktarian moonrise simulation (VOY: "Revulsion"), Ktarian glaciers (VOY: "Macrocosm"), Ktarian burial rituals (VOY: "Emanations"), or Ktarian music festival (VOY: "Non Sequitur"). 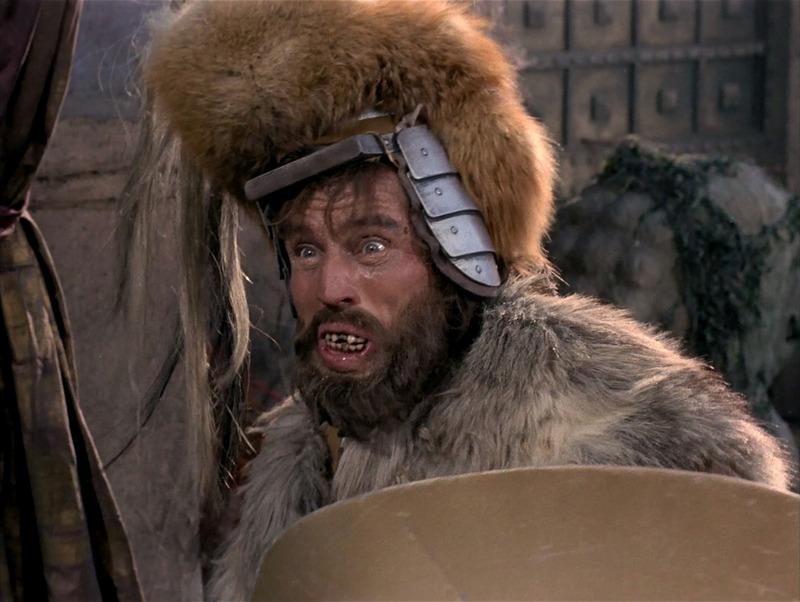 There are also many Ktarians supposedly living on Earth (VOY: "Hope and Fear"). 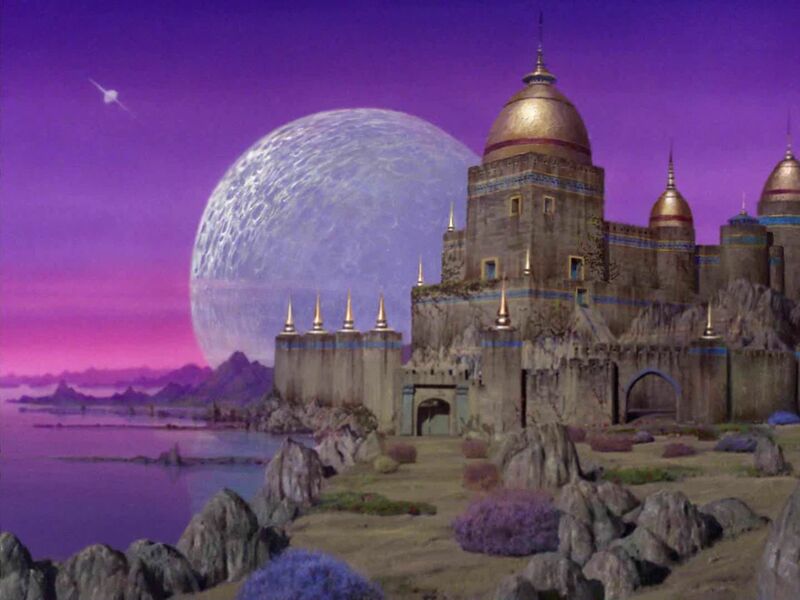 It may be doubted that Ktarians and their culture would be that popular if they, as a species on the whole, had made an attempt to gain control of the Federation. In VOY: "The Voyager Conspiracy" they are finally explicitly mentioned as Federation members or allies: "The Ktarians were officially with the Federation but they sympathized with the Maquis." Chakotay: "What have we got here?" Naomi: "I've been learning all about it." Seven: "Naomi programmed the geophysical and atmospheric conditions." A possible explanation for the cultural and political observations is that Etana Jol and her possible aides (we never saw any of them) were renegades, not acting on behalf of their government. But how could they expect their plan to succeed? Were they going to control the Federation all alone, without the support of a planet government or a large military? That would have been a ludicrous idea. Perhaps the bad boys (and girls) from TNG: "The Game" are pronounced just like "Ktarians" but are actually a different race spelt "Caterians" or something like that. The possible confusion in such a case would be alleviated, since the other Ktarians would be much better known anyway. 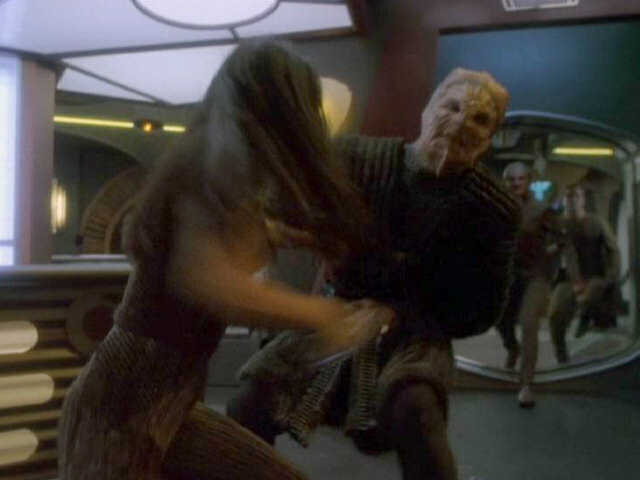 More evidence for the "two races" theory comes from VOY: "Fury". Here a past version of Tuvok has visions of Naomi before she is even born, and without knowing about Ensign Wildman's pregnancy. In his assessment the then unborn child is "half-Ktarian". It may be objected that he may have known of Samantha Wildman's marriage to a Ktarian and only speculated that Naomi is what a half-human and half-Ktarian child should look like without actually knowing. But would such a conclusion be logical, even if we concede that he was a bit confused all the time in the episode? The different looks, the different affiliations and the different names of the planet(s) could be easily explained away if they occurred alone, but all of them combined gives us the impression that "Ktarians" in fact stands for two different races. If members of a race identified as "Ktarians" had appeared in Enterprise, we would have expected them to look like Naomi Wildman and not at all like Etana Jol. Surprisingly the Miradorn as seen in DS9: "Vortex" sport the same make-up as Etana Jol. Only the eyes are different. A closer look reveals that Etana Jol has yellow eyes with cat-like pupils, yet horizontally oriented. The other Ktarian variant as well as the Miradorn have human eyes. Maybe the eyes are a special feature of the female members of her race, or she is simply wearing contact lenses. Anyway, Etana Jol and the Miradorn look much more alike than Etana Jol and Naomi Wildman. We may ignore this as another case of two races looking the same. But perhaps the people who attempted to take over Starfleet in TNG: "The Game" are actually Miradorn of whom for some reason many are Ktarian nationals, which is commonly known in Starfleet and wouldn't raise suspicion? 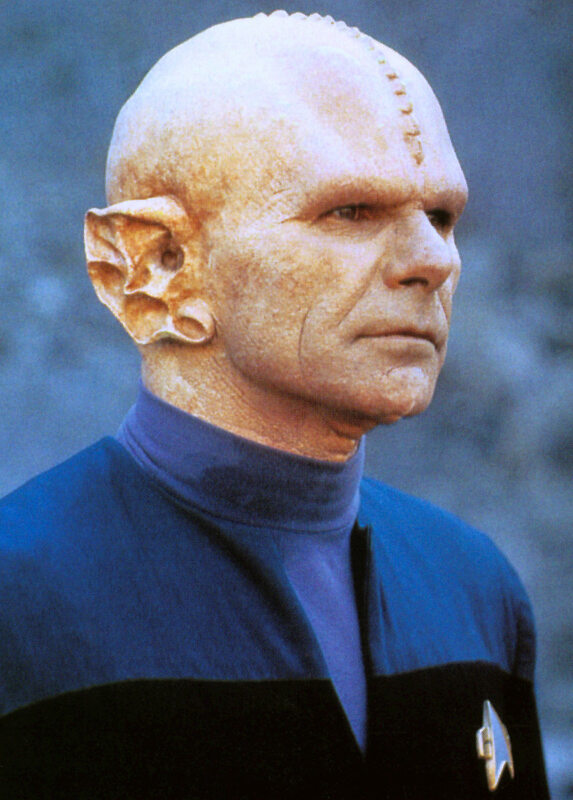 The same make-up with the protruding cranial bones showed up in VOY: "Fair Trade", but was unquestionably neither intended to be Miradorn nor Ktarian in this episode. However, there is surprising evidence of the Miradorn/Ktarian look in ENT: "Demons", at the conference on Earth that would pave the way to the foundation of the Federation. It almost looks as if someone in the Art Department made up his mind and purposely re-used what he thought was the real Ktarian make-up on this occasion that necessitated familiar faces. Anyway, the race could as well have been the Miradorn. The oddity of a third Ktarian make-up in the form of a Borg drone (Ktarians are "Species 6961") remains unexplained, however. We may make up an easy explanation that the drone belonged to any of the two Ktarian versions, but his forehead was flattened in the course of the assimilation. Actually no drone until "First Contact" had distinctive features of an alien race, they all looked more or less like assimilated humans. Still, it is unlikely that the Hansens would recognize a human-looking Ktarian drone among many human-looking drones, unless they had better bioscanners than would be available 20 years later. The Norcadians were first brought up in VOY: "Tsunkatse". Voyager visited the Norcadian homeworld and some of the crew attended the Tsunkatse games that allegedly took place on the planet. In reality, the Tsunkatse fighters were prisoners on Penk's ship from where the games were transmitted to a number of planets in the whole sector. It was not explicitly mentioned, but given the difficulties with the Norcadian authorities it seems plausible that Penk and his helpers with the pronounced forehead bones were supposed to be Norcadians. While there were at most two members of each race in the audience, Penk and his aides were all of the same race, as were several of the spectators. The Fact Files even explicitly state that the Norcadians developed Tsunkatse. Janeway: "I recognize your species. You're Brunali [to Icheb], and you're Norcadian. Do you remember your world?" Mezoti: "A theta-class planetoid. Population two hundred and sixty million. Binary suns." Janeway: "And what did it look like when those suns set each night? Can you remember that?" Curiously Janeway of all crew members would least likely recognize a Norcadian because she was on an away mission with the Delta Flyer for most of the time during the Tsunkatse incident! But then again, she would most likely not know the Brunali either. She may have found both in a database about the current region of space. 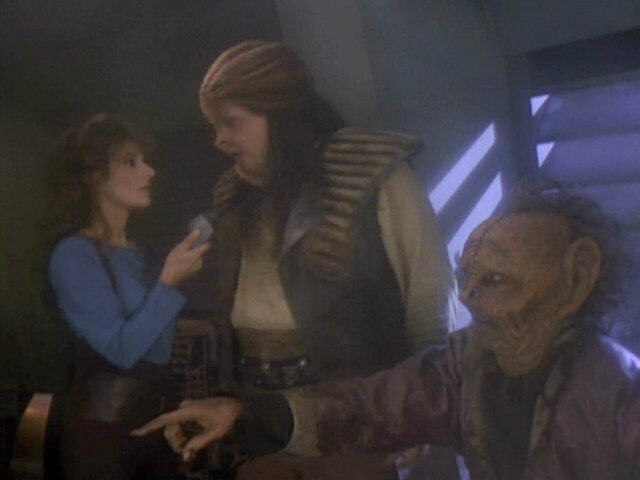 Anyway, in VOY: "Ashes to Ashes" Mezoti identifies herself as Norcadian (Species 689) too. To make the matter even more confusing, there is one blatant inconsistency about Mezoti's home planet: The binary suns mentioned by Mezoti are in line with Neelix's sunburn while he is on the Norcadian homeworld. But the planet from "Tsunkatse" is obviously a quite big Class-M world and not a "theta-class planetoid" as Mezoti described it with Borg terminology. Moreover, 260 million inhabitants, less than the USA, seems very low for a whole planet. The inconsistencies with the race's appearance as well as with the look of the planet are either the result of a failed attempt to create inter-episode continuity, or the dialogues from "Collective" and consequently from "Ashes to Ashes" were retained from a draft that didn't yet take into account the events of "Tsunkatse". There is a possibility to be considered that Mezoti may have referred to the world where she was born, a small planetoid colonized by the Norcadians. But what she said about that place was obviously not the memory that Janeway may have expected to hear, but an excerpt from the Borg database. When Janeway mentioned "Norcadian", Mezoti would most likely not describe an irrelevant small planetoid, but the Norcadian homeworld. Mezoti (to Seven): "I've been studying all available data relevant to this species, as you recommended." Seven: "Familiarizing yourself with their culture will help you adapt." While talking about Mezoti familiarizing herself with the new culture, she would rather not refer to the customs on her home planet. Since the statements of Janeway and Mezoti herself that the girl is Norcadian are unambiguous, I tend to believe that Penk actually isn't Norcadian, but his activities were only backed by the Norcadian government. 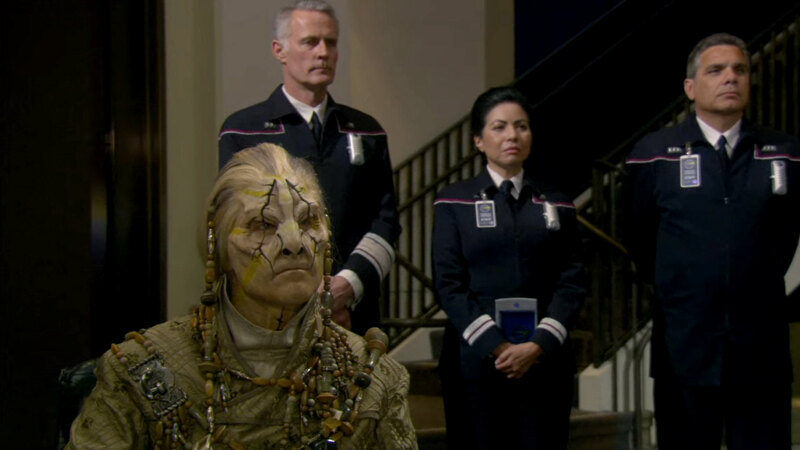 The fact that it was never attempted to return Mezoti to her home planet and her own kind but rather to Wysanti could be explained with the trouble Voyager had with the Norcadians. But while the Borg may have strange ideas of a "planetoid", it remains unexplained why the home planet(oid) of an advanced and possibly quite powerful civilization has no more than 260 million inhabitants. I am grateful to Christian for providing several facts concerning the Ktarians. Special thanks go to Jörg Hillebrand for screen caps and additional observations about the Rigelians, the Ktarians and several more. Thanks to Lin for the suggestion to take care of the Gorn, to Rickert Vlaanderen for objections concerning the Ktarians, to AJHalliwell for spotting the Ktarian make-up of the Miradorn and the latest Boslics and to Kelso, Reverend and Harry for more supplements.